It's a great movie that grows on me every time I see it. 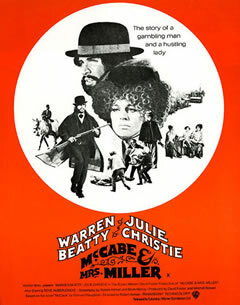 After reading your post, now I want to run home and pop my DVD of "McCabe and Mrs. Miller" into the player tonight. @Chimesfreedom: This movie is definitely in my top 5 of all time. Absolutely beautiful. Thanks for stopping by, and for the comment (and enjoy the movie)! A beautiful film and incredible title sequence. A colleague of mine just wrote a brilliant post on www.99moves.com about the best title sequences! Video SEO: Thanks for stopping by, and for the comment. I visited the link you left, and the article raises an interesting point about the level of art involved with creating title sequences. The clips chosen are also great examples of this.